I have just been given the book and its lovely, I cant wait to get going… but Im quite new to sewing and have only made patterns with a sew line marked on the paper. Do the patterns include the seam allowance or should I add one on? I know this is a real beginners question -sorry. All the patterns already include the required seam allowances. The instructions for how much seam allowance are built right into the instructions for each piece. Hope that’s helpful! I have sent two emails with no response to my questions regarding the brick bag assembly from the zipper point on. 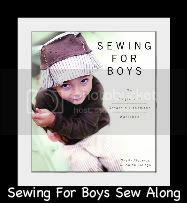 I would appreciate help because I have purchased fabulous fabric to make these for some special boys. I have just sent you an email, Cindy. Thank you for posting to the site, as I have not seen any emails!